Nearly 60 years after Methodists fully welcomed women to the pulpit, many who heeded the call to clergy service say they continue to fight for acceptance. Rev. 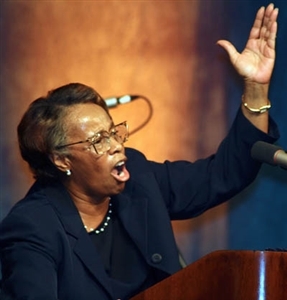 Geraldine McClellan addresses a crowd of African-American clergy in 2009. FLUMC file photo. Even in the Florida Conference, the first regional area to endorse a female candidate for bishop in the Southeast Jurisdiction, most clergywomen interviewed reported lingering resistance to female leadership, though they believe the climate is improving. “As women, we have to work twice as hard to prove that we are worthy of this calling,” said Rev. 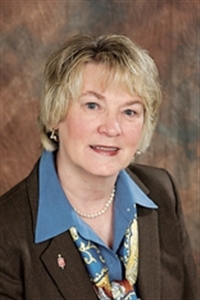 Geraldine McClellan, senior pastor at Mount Pleasant UMC, Gainesville, and a former district superintendent, who began her pastoral career in the 1970s. 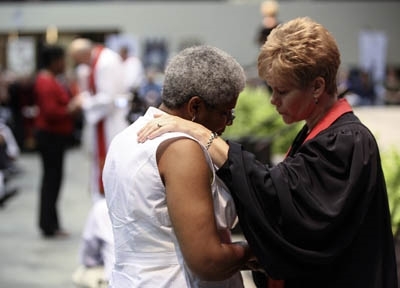 Records at the Florida Conference indicate the number of clergywomen lags far behind male counterparts, with women accounting for 27 percent of the conference’s active clergy. Those findings mirror late 2006 figures cited by the General Board of Higher Education and Ministry for the denomination as a whole. The Association of Theological Schools reports that women made up about 37 percent of students in Protestant seminaries last year, and accounted for only a third of students who are pursuing a master’s degree in divinity. Duke Divinity School reports on its website that about 42 percent of students enrolled there at the start of this academic year are women. 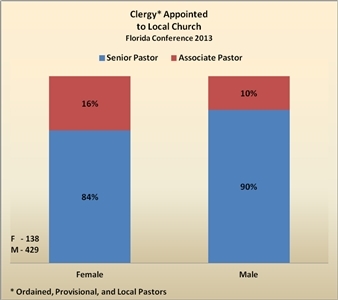 A breakdown of women and men among clergy candidates pursuing licensing or ordination at the Florida Conference reflects a similar trend. Of 79 people who signed up for clergy candidate retreats this year, 31 – or about 39 percent -- were female. Florida Conference records show 138 of 567 active church pastors are women, and 84 percent of those have senior pastor appointments. Click here to see a larger version. Source: Florida Conference Knowledge & Information Services. At Annual Conference this year, an equal number of men and women were ordained as full and provisional elders. However, all seven licensed local pastors were men. Rev. David Dodge, who was appointed assistant to the bishop this year after serving 16 years as the head of Clergy Excellence, said he was at a loss to explain why more women don’t pursue professional ministry. The three bishops appointed to the Florida Conference during his tenure have all stressed that only the “gifts and graces” of an individual and the missional needs of each local church will be considered in choosing shepherds for Florida flocks. “My sense always was that we had episcopal leadership that said it’s not going to be a factor whether someone is female or male,” Dodge said. Florida Conference records show 84 percent of women pastors receiving senior pastor appointments compared to 90 percent of male pastors. Women pastors interviewed, including retired Bishop Charlene Kammerer, said support of female appointments by church leadership – typically male – has been crucial to local church acceptance of women preachers. Kammerer started her ministry in the Florida Conference in the 1970s. She served as senior pastor of two large congregations – Wesleyan Memorial in Fort Myers and Saint Paul’s in Tallahassee -- and as a district superintendent before becoming the first female candidate endorsed for the episcopacy by an annual conference in the Southeast Jurisdiction. In 1996, she became the jurisdiction’s first woman bishop. Church members who gave her a chance to preach, teach and lead would gradually be won over, Kammerer said. Her rise through the church leadership ranks would not have occurred without the championship of bishops and district superintendents, then all male, Kammerer said. As women assume high leadership positions, she said, it is important for them to support their sisters in similar roles. During her episcopal residency, first in North Carolina and then in Virginia, Kammerer continued to encounter resistance to women clergy appointments to large churches at the cabinet and local church board level. 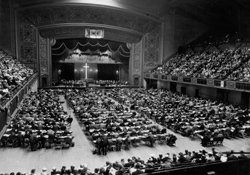 Though women preached in the Methodist Church from its Wesleyan beginnings, full ordination privileges for women were approved by the denomination's General Conference in 1956. Photo from the General Commission on Archives & History. “It sometimes took me as bishop to go and sit with that parish committee” to coax them into accepting a woman, she recalled. “What I continued to hear throughout the younger years of a woman’s life was the genuine concern of taking away from family time. What if she gets pregnant? How will we function? For women of color and different cultural backgrounds, the path to the pulpit likely holds obstacles beyond gender. McClellan, in Gainesville, said her father was a pastor, and his love for people in spite of their differences served as a stepping stone to her calling. She acknowledged her call to ministry in 1967 but said she received little encouragement to pursue it. “Women are very ready to serve larger congregations, but larger local congregations have not been ready to welcome women,” she said, offering her own experience at Mount Pleasant, where she began in 1988. 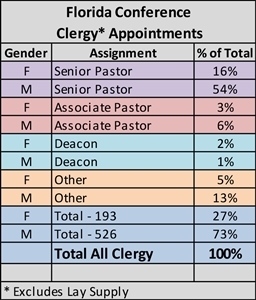 Records indicate women make up little more than a quarter of 719 clergy appointments, including deacons and extension ministry heads, in the Florida Conference. Source: Florida Conference Knowledge & Information Services. “Even though this congregation was familiar with my family members who served in leadership roles, and even though they knew me as a child, I had to prove myself to them,” she said. Like McClellan, Tamara Isidore had a strong role model in her father, Saint-Ange Lefranc, of the Light and Peace Church of Haiti. Though his parents practiced the island’s voodoo religion, he became a devout Christian and encouraged his daughter to do the same. Isidore was appointed local pastor of Friendship UMC, Clearwater, in 2010. She believes her life journey from Haiti to Bible college in New York State, coupled with being mother to seven children, has given her a wealth of experience and maturity. But she too has felt challenged in the role of woman minister. “I come from Haiti, and all many people know about that country is what they see on the news: earthquakes and poverty,” Isidore said. When she was assigned to an all-white church, she lost the majority of the congregation, but worshipers eventually started coming back. “My ministry was challenged but I had God’s promise,” Isidore said. Rev. Juana Jordan was a successful journalist and media consultant before heeding the call to ministry in 2008. A single 40-something fresh out of Candler School of Theology, Jordan was appointed as a full-time local pastor to Harris Chapel UMC, Oakland Park, in July 2011. This past June, she became a provisional elder in the long process of ordination. The fact that she’s a woman and a nurturing person has helped her relate to her congregation with compassion. Rev. Catherine Fluck Price, co-pastor with her husband, Steve, of Harvest UMC, Bradenton, and a delegate to General Conference last year, said fear lies at the heart of many people’s reluctance to accept women pastors. “Our human nature is just to feel threatened by people that are different from us, that look different or act different,” she said. Rev. Catherine Fluck Price, right, prays with a lay member at Annual Conference 2010. FLUMC file photo. As for negative reactions coupled with scripture like 1 Corinthians 14:33-35 admonishing women to be silent in church, McClellan points out that women were a big part of Jesus’ life and ministry. Some may genuinely believe in a literal interpretation of the scripture, “but I do think those people are picking and choosing passages,” Fluck Price said, adding that few follow biblical admonitions that women cover their heads or shun jewelry. She and McClellan said they would advise women entering the ministry to join a clergy support group as soon as possible. “If there’s not one, then start one,” McClellan said. Her advice to women answering the call? Use your personal gifts to serve God and help others on their discipleship journey. 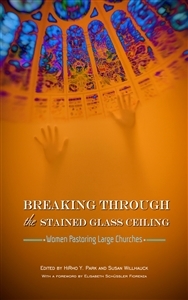 In "Breaking Through the Stained Glass Ceiling: Women Pastoring Large Churches," Revs. HiRho Y. Park and Susan Willhauck bring together a series of essays that offer a rare glimpse into the daily lives and spiritual journeys of trailblazing clergywomen. Published by the General Board of Higher Education and Ministry, the book’s contributors all have served as lead pastors in congregations with 1,000 or more members. “These trailblazers’ stories are intriguing and full of wisdom, passion and grace as they strive to perform top-level executive leadership while at the same time juggling spirituality, work, family and their personal life,” said Park, who co-edited the book with Willhauck. To read this review by GBHEM freelance writer Renee Elder, click here. -- Susan Green is the managing editor of Florida Conference Connection. Anne Dukes is a freelance writer based in Atlanta.